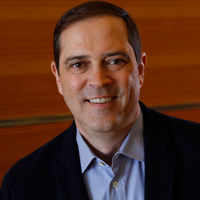 Meet Cisco’s new CEO Chuck Robbins, who will succeed John Chambers, who spent 20 years at the helm of the world’s largest networking company. This “unexpected” announcement of a new CEO came as a surprise to many. Robbins will take over Chambers on July 26, 2015. He will also join Cisco’s board. Chambers will continue as Chairman of Cisco’s board. That Cisco was getting a new CEO was a well-known fact and Chambers had made that announcement in 2012. The reason why many were caught by surprise is that “nother internal candidate, Rob Lloyd, had been the heir apparent for years,” writes the Business Insider (BI). Apparently Robbins was a “unanimous” choice by the board members as the BI post points out. Cisco’s new boss is cut from same cloth as predecessor is how the Financial Times described the change in leadership. Robbins, the FT article said ” is a career salesman with an easy southern manner — just like his long-serving predecessor, John Chambers.” Robbins joined Cisco in 1997 and is currently senior vice president of worldwide operations. This article in Fortune has more details on how Robbins came to be Cisco’s new CEO and what Chambers thinks of his successor.